As your trusted HVAC service provider, Climatrol Inc. offers several valuable services to help increase the efficiency of your residential and commercial heating and cooling systems. 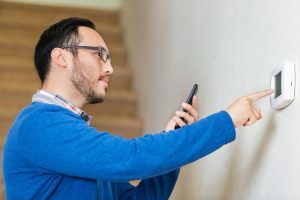 We offer advanced thermostat systems, as well as installation of zoning and control panels in Bridgeport, Clarksburg, and throughout our West Virginia service area. If you are interested in learning more about how we can maximize your HVAC system’s efficiency to help you save money on your fuel bills, contact us! Our technicians replace faulty thermostats of all types. In addition, we offer installation of the most advanced programmable thermostats available. With 24/7 control, these thermostats enable you to provide the precise amount of heating or cooling only when needed. Stop paying to condition your home or office’s air when no one is there to appreciate it! Remote control and Internet options are also available that enable you to monitor and adjust the temperature as desired. For additional control over exactly where your heated or cooled air is applied, we also offer zoning services. If you are planning to install a new heating or cooling system, we will work with you to design a zoning plan to help optimize the efficiency of your property. Many homeowners are not aware that we can actually zone existing HVAC systems, as well. We offer precision zoning control by floor, or even on a room-by-room basis. If you have rooms in your home, such as guest bedrooms, utility, or storage rooms, that are unoccupied or used infrequently, it is generally not wise to heat and cool these areas to full capacity when not in use. Let us help! Climatrol provides installation of complete zoning systems that enable our customers to save up to 30% (or more) on energy bills. By placing an automatic damper in the ducts controlling airflow to each room (or zone), as well as a thermostat in each zone, this cost-effective method ensures that you are not throwing your hard-earned money away. Program and adjust your zoning preferences with the simple to operate zone control panel, and relax while the system takes care of everything for you. With energy expenses rising continually, we can help you take back control of one of your largest monthly expenses. Start saving money today. Contact Climatrol for a consultation, to request a free quote, or to schedule your thermostat or zoning installation: (304) 623-0606.